This is the pre-OP game of OP Hammerhead, meaning that it will lead up to the operation with intel and reconnaissance. 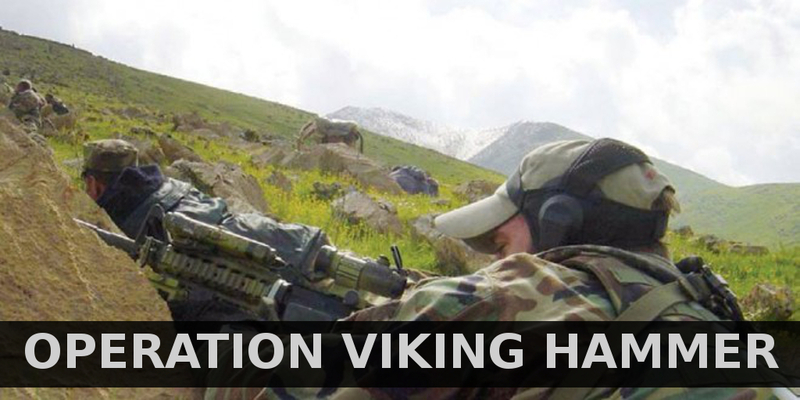 Operation Viking Hammer was an unconventional warfare operation during the Iraq War which took place in northern Iraq, commonly known as Iraqi Kurdistan. The goal of the operation was to eliminate the Ansar al-Islam terrorist as they had occupied parts of Kurdistan. In addition, at least two other militant Kurdish Islamic groups were operating in the region, and these generally aligned themselves with Ansar al-Islam. After Turkey had denied the U.S. 4th Infantry Division passage through their borders, the burden of carrying out the northern front of the war in Iraq fell on an ad hoc coalition of Americans to include CIA Special Activities Division paramilitary operations officers, Special Forces soldiers from 10th SFG and airborne units that parachuted into northern Iraq, and Kurdish Peshmerga forces of the Patriotic Union of Kurdistan and Kurdish Democratic Party. Before beginning the attack south, the coalition forces first needed to destroy Ansar al-Islam's enclave in order to secure the Kurdish rear areas and free Kurdish forces to take part in the advance southwards. This is a very slow phased game ! Do think about it before joining, a lot of walking and doing reconnaissance. Antingen så ser du till att ladda hem mitt addonpack och sen har du igång de sedvanliga tilläggsaddonen. eller så får du ramla över alla addons och hämt-trixa själv, PWS pysslar jag inte med, men tar ZiP över OP_Hammerhead mappen på Repot så är ju det en variant.. annars, lycka till !